We boarded the train in what we thought was carriage B1, looking for beds 41 & 43. A man was sat on my bed and there appeared to be no bed 43. We dumped our bags down and Mike began searching for the missing bed all the while more people were boarding and huge bags were blocking every direction. The chaos became even more chaotic as people turned up claiming the bed was there’s. It seemed to dawn on us all at the same time: we were in the wrong carriage. The electronic sign outside said B1 but the tapped on bit of paper to the side of the train said A1. We detrained (a verb I’m inventing) and moved down the platform and found B1. Our beds were free and we placed our back packs underneath the lower bed. Our section slept 6. Three bunk beds on each side. 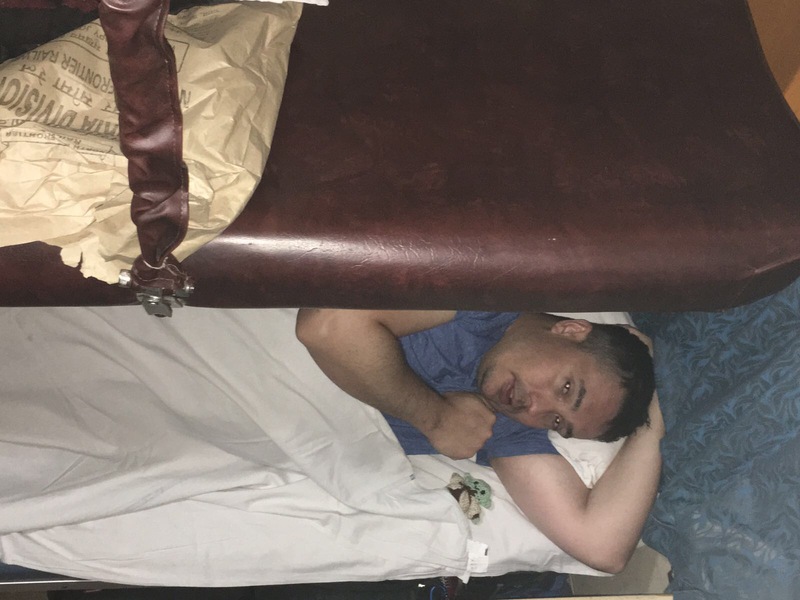 The middle bunk was folded against the wall so everyone could sit in the lower bed. The top bed was filled with everyone’s sheets, pillows and blankets. All freshly laundered and in brown paper bags. I was quite impressed and hadn’t considered that we’d be given bedding and that it would be clean. There was even a plug to charge what ever you wanted. Binu (our guide) explained about the different class carriages from 1st to well sleeping on a wooden bench with no glass in the windows and the breeze whistling through, so I was glad to be where I was: 2nd class I guess. 43 was a top bunk and Mike’s 41 a bottom, so we waited for a mysterious person with ticket 42. Tom (44 bottom bunk) and Ruth (46 top bunk) were also in our section opposite and waited for their mystery 45. As it turned out these people never came and our guide took 45. We talked, played cards and got to know each other all a bit better. Our main entertainment however was the variety of things on sale that passed through the carriage. If you’re from England you occasionally get a person with a trolley selling some crisps, coke and sweets or on a longer trip a buffet car. 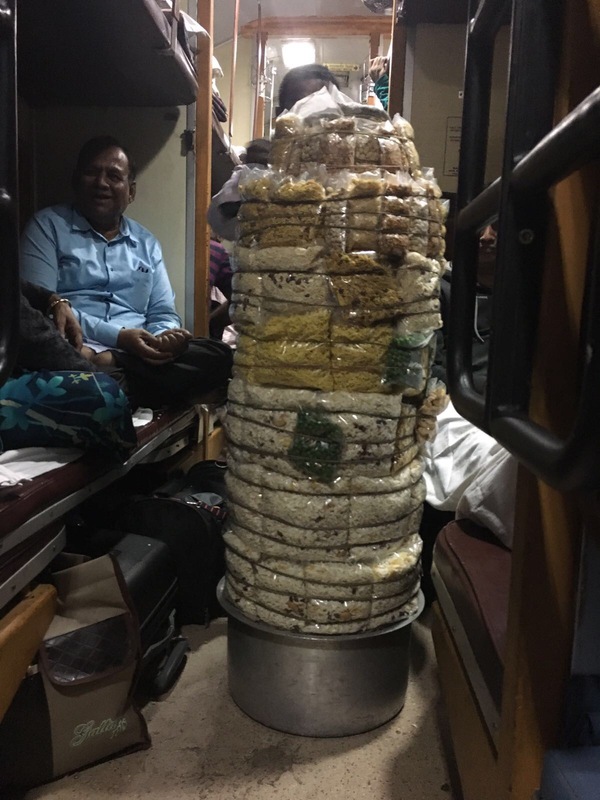 On an Indian train you get all sorts. It started off with a man selling Chi tea, quite common, it is sold on every corner. Then came a man with boiled eggs- an odd snack choice. A man with bottles of water- we’d already stocked up though. A variety of men came through each selling different types of curry, noodles etc. Then came individual men selling sari’s, scarves, blankets, safety pins, children’s books (colouring mainly), games (from a rubix cube to a magnetic dart board), a sticky Spider-Man you could throw at the wall and the list goes on. Some extremely bizarre products- even our guide was baffled and hadn’t seen such a variety before. 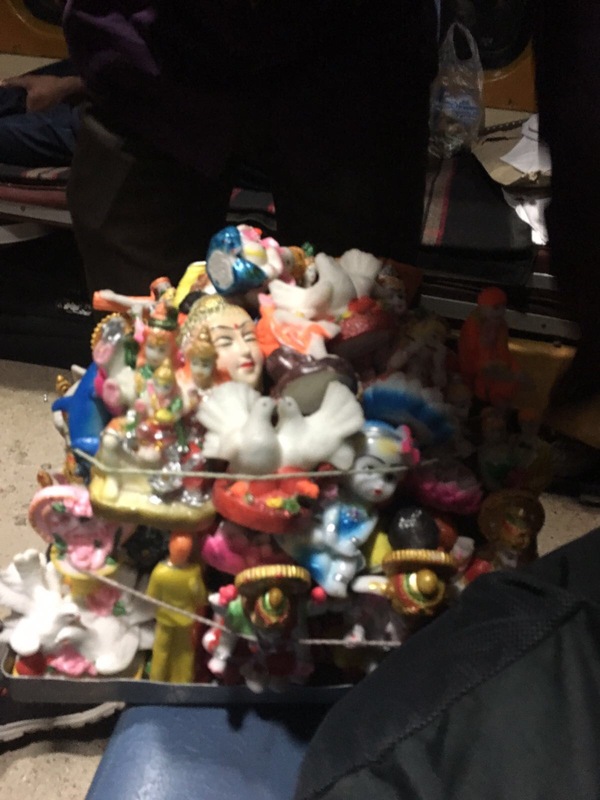 Ruth was taken with a man selling plastic idols and gods; mainly Hindu Ganesh, Hanuman etc and Jesus oddly. Not just any Jesus, a bendy one was how he was described by the seller. Similar to a dog toy texture Ruth bought him as a gag present. The sellers came back and forth passing through several times up to about 6 each I’d say. One of the final sellers to pass through could be heard down the end of carriage first. ‘T-t-time, p-p-pass’ could be heard repeated over and over in an elderly Indian accent. ‘T-t-time, p-p-pass’ was heard over and over again. Finally he came into our section with a tower bigger than him of nuts, seeds and goodness knows what else. ‘T-t-time, p-p-pass’ he repeated over and over, pouring free samples into our hands. His manner and phrase had everyone giggling and we felt obliged to purchase something, at 10 rupees (12p) it wasn’t going to break the bank. In fact the salted peas we bought were very tasty. Binu explained that the ‘T-t-time, p-p-pass’ man was a local celebrity having done this job his whole life and had recently had a documentary made about him. It was approaching bed time (about 9:30pm) and I decided I should brave the loo before I climbed my bunk. At the end of carriage was the long drop Indian toilet. The lock didn’t work so I stood against the door, liquid rolling around the floor as the train chugged on. The smell was extremely pungent and I had to hold my breathe. Possibly the worst toilet I’d ever experienced. I got back and used antibacterial gel immediately. We unshackled the middle bunk and everyone made their beds. The movement on the top bunk seemed to be worse than at ground level. It felt at times like a mild roller coaster. The lights went off and the night light (which was next to my head) shone brightly. I slept with my day bag under my pillow and mike used our extendable lock around our backpack and shoes, we didn’t want anything being taken in the night. It got cold, very cold and the blanket was definitely needed. We were headed north I guess. I didn’t sleep well. From the rocking, to snoring, to the trains hooting as they went passed it was a night of 10 minutes here, dead arm turn over, 10 minutes, dead arm turn over. Mike apparently slept well although his feet stuck out the end of his bed and people kept holding on to them to steady themselves as they moved down the rolling and rocking carriage. We ground to a halt at several stations through the night, waking us from the little sleep we were getting as more people got on and off. We didn’t want to miss our stop and end up in Middleofnowherestan – so alarms were set for 5.45am for a 6.20 arrival! Upon arrival we packed up, left the sheets in a messy pile on the top bunk and detrained. 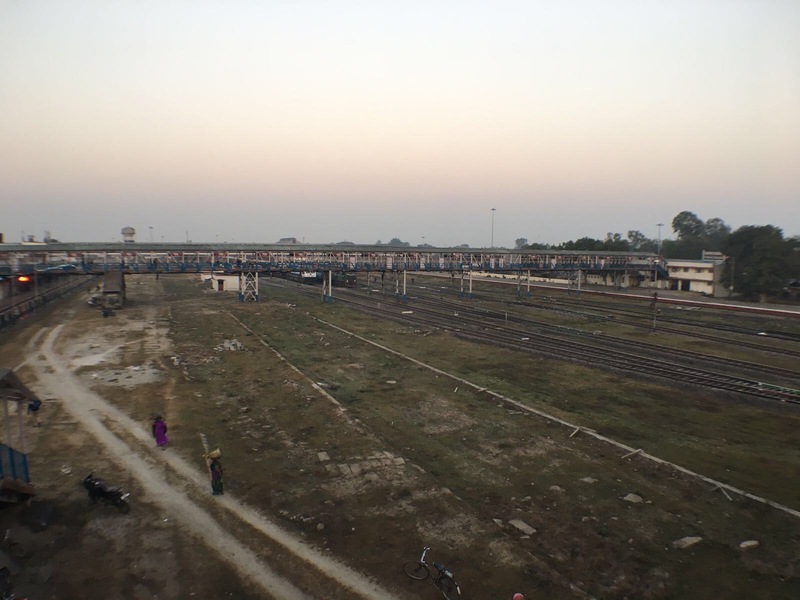 The 14 hour train journey was over and we had arrived at the Indian equivalent of what looked like Clapham Junction- New Jalpaiguri. This made me laugh. The pictures that I conjured up. Can’t wait to see the real ones.